Wow! 100 days already! Somehow it seems like way less and way more at the same time. Over the past 3 1/2 months, lots has happened. I have moved, settled in a new house, and begun language study. I have gone from very minimal Spanish to being able to follow a bit more. I am now able to use 1 of 5 Spanish past tenses and present tense, which still leaves a long way to go, but I am beginning to be able to converse in more than just what is happening to me at this present moment! On Monday I have my final exams and hopefully I will pass and officially have an A1 level of Spanish. (In order to begin ministry I have to have a B2). Many of you have also been asking if I am enjoying the warm weather here. To be honest with you, it actually isn't that warm (although two days this past week we got sun and plus 15!). Recently, it has been raining a lot. I would compare the weather to Vancouver. There is no snow (although we had hail one day), but the wet cold is something completely new to me. At night we get close to freezing (sometimes even below zero) and at day if we get to plus 10 its a good day. However, I think the biggest adjustment is that houses just aren't as warm in Spain. The insulation isn't great (I have a draft in my room from the window), my whole house is tiled and heating is kept low as it saves money. Thus I am usually dressed the same inside as I would be outside. This has taken some getting used to. I also, almost always have a blanket and a cup of warm tea, coffee or other warm beverage in my hands to keep them warm! This past week we had a Multicultural Teaming Training for two days I really enjoyed having people in the house and learning about the dynamics that come with having a very multicultural team. 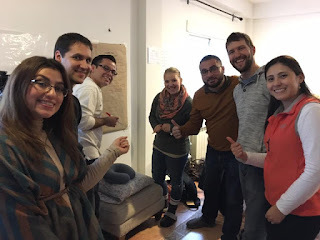 Most people expect the challenges of adjusting to a new culture, language and mind set when they arrive in a new country, but often we forget about having to adjust to our team. Spain has the most multicultural team in all of SEND and although this brings certain challenges with it, I feel honoured to be a part of it!